Lorna Jeruwa, 15, fled South Sudan with her 2 little brothers when fighting broke out in November 2016. They became separated from their mother, so Lorna now has the responsibility of feeding and taking care of her brothers, Isaac and Francis. 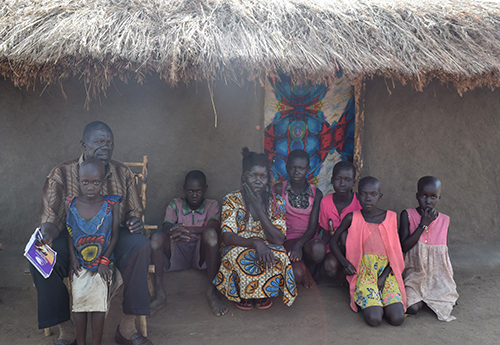 They are living in Bidibidi, a refugee camp in northern Uganda, with seven other children. Lorna does not know where her mother is today. Food is scarce. But food is not their only need. Many young people have become heads of household and struggle to balance their studies with taking care of their siblings. According to the U.N. High Commissioner for Refugees, Uganda’s refugee settlements are home to 2,759 children who have been separated from their parents or caregivers, as well as 1,925 children who are not accompanied by any adult. Lorna is not alone in her situation. Just 5 years since South Sudan gained independence, fighting between government and opposition forces has uprooted more than 1.5 million people. South Sudan has become the largest refugee crisis in Africa, and the third largest in the world, after Syria and Afghanistan. An estimated 813,908 South Sudanese refugees are in Uganda. The vast majority—86%—are women and children. To reach safety, most walked through the bush for several days because they feared being attacked on the roads. Ruth Asimtai, a mother of 8, is also at Bidibidi. Ruth’s biggest struggle is gathering water. A household needs water every day for cooking, cleaning, bathing and drinking. Ruth owns only 2 5-gallon cans to hold water. That means she must make several trips to a camp water source every day to meet the family’s needs. To make matters worse, the water taps are often crowded. According to the UNHCR, the Bidibidi camp has become one of the largest refugee settlements in the world, having received 272,206 refugees. 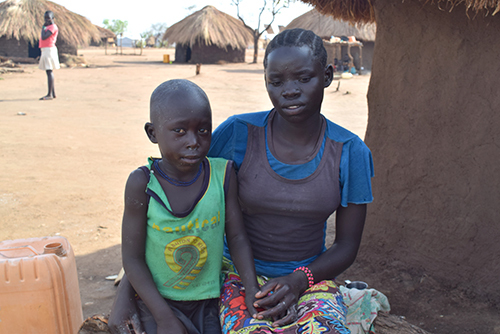 While new settlements are opening to support the rapid influx of South Sudanese refugees, major needs remain for refugees like Lorna, Ruth and their families. With your support, Catholic Relief Services continues to work with partners to scale up critical water infrastructure and sanitation and hygiene assistance at the settlements. Improving water distribution at a high-yield water source, serving 400 families. Constructing 2,000 household latrines and decommissioning 500 unhygienic communal latrines. Improving hygiene in target communities through distributing supplies like women’s sanitary products and water containers. CRS plans to support 6,000 people, or 1,200 families, with these activities over a 12-month period.